NDFB chief Ranjan Daimary. File image. Prominent rights activist and sister of NDFB Chief Ranjan Daimary, Anjali Daimary has said that “peace process and this kinds of judgement cannot go together”. Anjali Daimary was referring to the verdict delivered on Monday’s by the CBI Special Court’s in connection with October 30, 2008 serial blast cases in Assam that left 88 people dead and several hundreds injured. “We have not received anything on the judgment so far. But we are told that the Court has convicted him and 14 others. Let’s hope for the best, but if this is the verdict, then this will affect the ongoing peace process,” said Daimary while talking to waiting journalists in Guwahati. “He is the head of the organisation so if he is convicted, it will affect the peace process,” said Anjali who heads Bodo Women Justice Forum, a women rights forum. 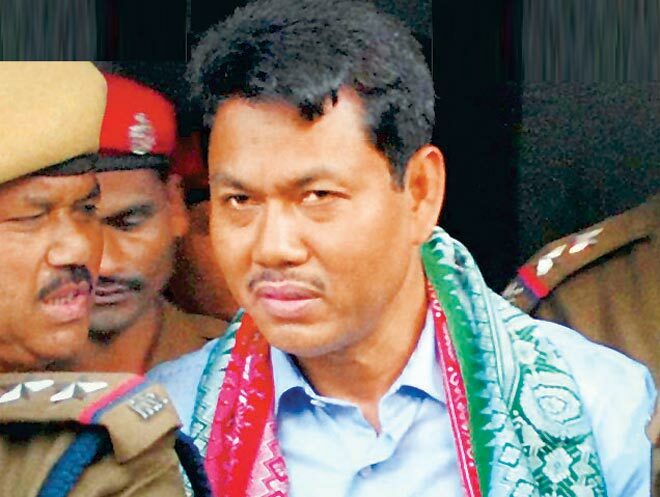 Ranjan Daimary was apprehended in Bangladesh in December, 2009 and he was arrested by Indian authorities after he had been handed over the BSF by the Bangladesh authorities in 2010. He was first released on interim bail in June, 2013 to facilitate his participation in the peace negotiation with the NDFB faction headed by him. Since then, his interim bail was extended several times.